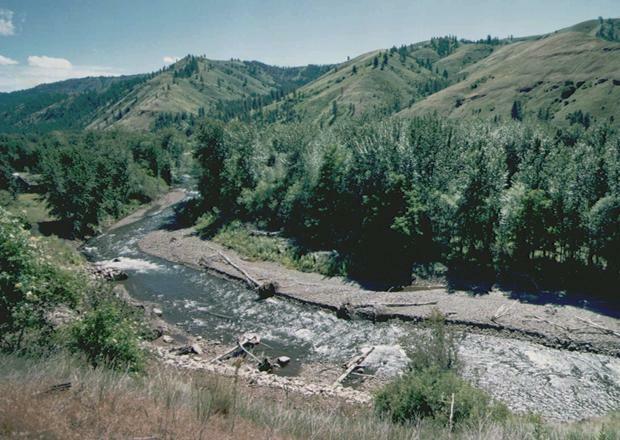 The Tucannon River is hemmed in by steep hillsides as it spills out of the Blue Mountains and toward the Snake River. But over the decades, people have further constricted its path. Roads, levees, campgrounds and artificial lakes have narrowed its wandering course, forcing the river to run straight and cut downward instead of spreading out and weaving back and forth across the Wooten Wildlife Area. The straight-jacket effect of human infrastructure has harmed fish habitat and contributed to rising water temperatures in the river, which is home to threatened spring chinook, steelhead and bull trout. Nature also has taken a toll on the eight man-made lakes there. Built in the 1950s to provide recreational fishing in the lake-poor region, many of the ponds have silted in and require expensive management. Weeds and warm water temperatures have harmed fishing, and some of the lakes are in danger of losing the ability to support trout and fishing. The Washington Department of Fish and Wildlife is proposing a makeover of sorts for the river and the lakes. The W.T. Wooten Floodplain Management Plan envisions unleashing the river by making the lakes deeper and skinnier -- essentially scrunching them against the steep slopes of the foothills. A few campgrounds could be relocated and sections of the road moved. Doing that would allow the river to meander across the flood plain. In theory, it would become more diverse, with pools and braided channels. The floodplain would become more of a sponge and hold onto its water longer. "By kind of spreading the river out, instead of having an incised channel, we will bring the water table up," said Kari Dingman, assistant manager of the Blue Mountains Wildlife Area Complex. The lakes are fed by the river. Glen Mendel, district fisheries biologist for the Washington Department of Fish and Wildlife, said excavating the lakes and making them deeper could tie them into springs and groundwater sources with cooler temperatures, making them more friendly to fish and fishermen. It would also help the department fix problems with small dams that created the lakes and have since been tagged as problematic by the Department of Ecology. The flood management plan is conceptual so far, Mendel said. The department is seeking about $1.8 million to conduct a feasibility study and could ask for a total of $16 million over six years to implement the plan. There is some urgency. Mendel said many of the lakes need considerable attention. "We are in the position where we are going to have to close some of these lakes in the next few years if we don't get them repaired," he said. "We are already starting to reduce trout stocking in some of the lakes because of reduced carrying capacity." A lot of money already is being spent in the Tucannon basin to improve habitat for spring chinook and steelhead. Steve Martin of the Snake River Salmon Recovery Board at Dayton, Wash., said the federal government's salmon recovery strategy looks to improve salmon and steelhead habitat in tributaries like the Tucannon to compensate for the harm caused by the four lower Snake River dams. The Bonneville Power Administration has committed to spending about $1.2 million a year to that effort. Projects have included placing large logs and boulders in the river to create pools. Both Martin and Mendel said BPA's commitment presents an opportunity for the state and federal government to join in improving salmon and steelhead habitat and also making lakes better for anglers. "If we can make those babies long and skinny and deep, it complements our salmon recovery effort," he said. "The Tucannon is really under a spotlight right now with big expectations and high hopes in terms of salmon recovery." WDFW surveys indicate the lakes, through fishing, generate about $1 million to $2 million of spending in local economies, attracting anglers from regional towns and beyond. Jim MacArthur, owner of the Last Resort KOA along the Tucannon, said fishing tails off as temperatures rise in July and August. "They just tend to heat up, which contributes to plant growth and weed growth, which makes it a little harder to fish, plus the warm water makes the fish more lethargic," he said. "Those lakes just need to be deeper." Under the plan, Big Lake 4, which is reserved for fly fishing, would be converted into a wetland. Mendel said another lake would likely be devoted to fly fishing. But he said losing the lake would not be much of a loss regardless. Big Lake 4 rarely gets fished because it's in such bad shape and it has such bad access. Mendel also said a long-term goal of the work is to make the river a better fishing destination with fully restored populations of steelhead, spring chinook, bull trout and resident rainbows. "We think there is all kinds of opportunity for better fishing in the future," he said.